WAVSEP 2012 is a comparison of 60 commercial & open source black box web application vulnerability scanners, performed independently by the WAVSEP Project and published on July 13, 2012. WAVSEP version 1.2, the environment used to perform the WAVSEP 2012 assessment was made open source and published online alongside the comparative review (http://code.google.com/p/wavsep/). 816 test cases that were vulnerable to Path Traversal / LFI attacks. 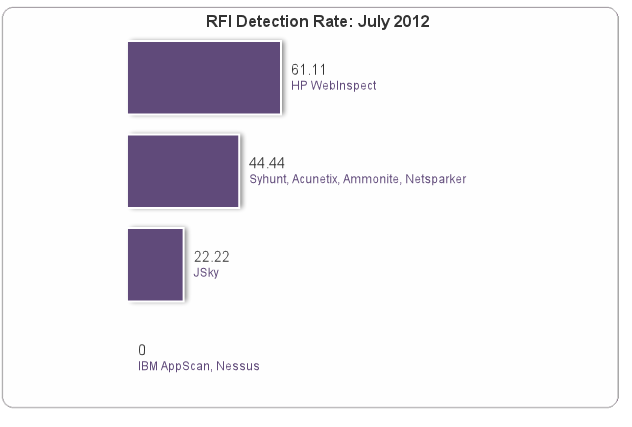 108 test cases that were vulnerable to Remote File Inclusion (XSS via RFI) attacks. 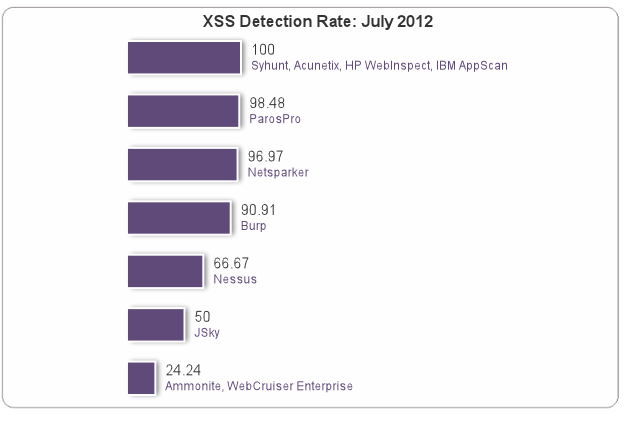 66 test cases that were vulnerable to Reflected Cross Site Scripting attacks. 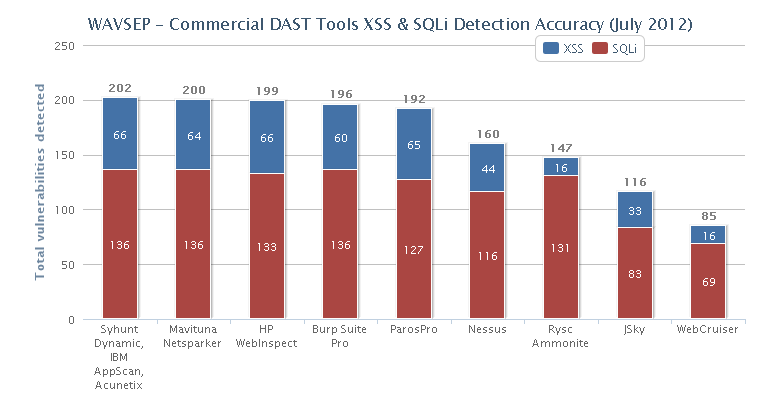 80 test cases that contained Error Disclosing SQL Injection exposures. 46 test cases that contained Blind SQL Injection exposures. 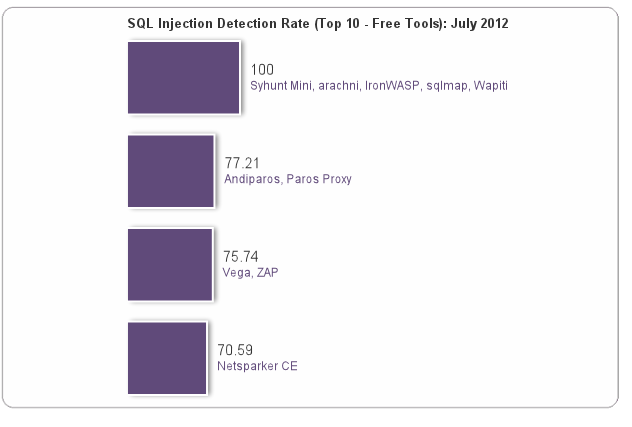 10 test cases that were vulnerable to Time Based SQL Injection attacks. 7 different categories of false positive RXSS vulnerabilities. 10 different categories of false positive SQLi vulnerabilities. 8 different categories of false positive Path Travesal / LFI vulnerabilities. 6 different categories of false positive Remote File Inclusion vulnerabilities. 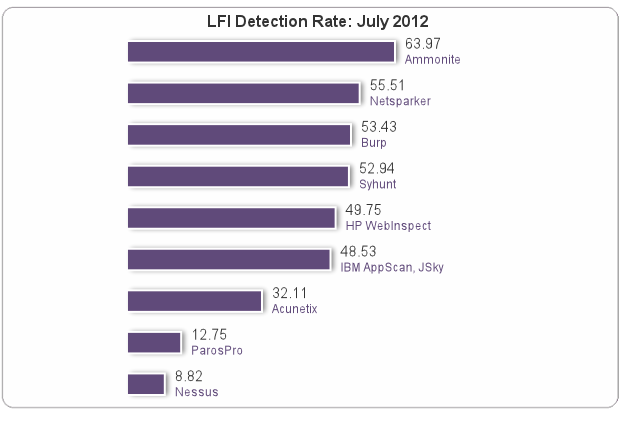 The charts below display the percentage of vulnerabilities detected by Syhunt Dynamic and the other tools from other vendors. Syhunt Dynamic achieved 100% detection of XSS vulnerabilities in the testing, with zero false positives thanks to its advanced filters. 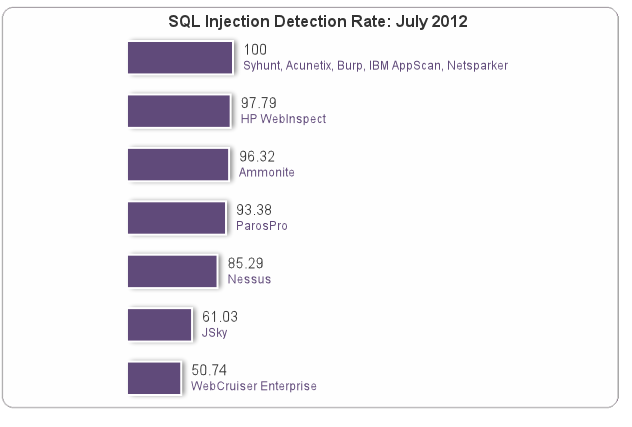 Syhunt Dynamic achieved 100% detection of SQL Injection vulnerabilities (both Blind and Time Based). This time Syhunt Dynamic successfully performed Time Based SQL Injection checks, a feature not available during the 2011 benchmark. Note: 0 indicates that the tool was not able to perform Remote File Inclusion (XSS via RFI) checks. 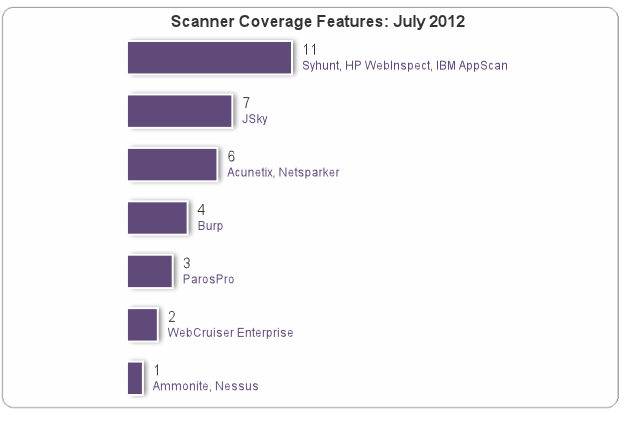 The chart below display the number of technologies supported by Syhunt Dynamic and the other tools from other vendors. 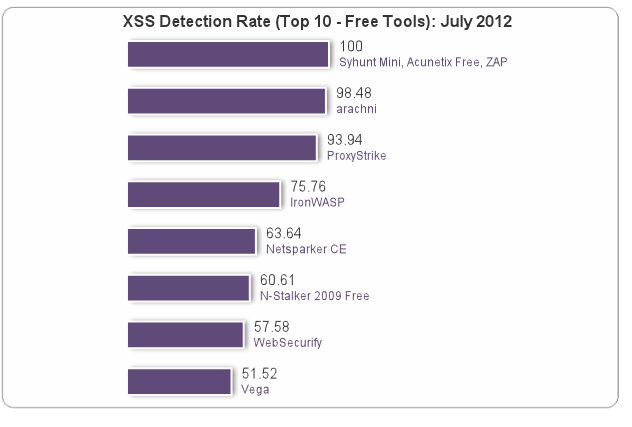 The charts below display the percentage of vulnerabilities detected by the tools.